COLUMBUS, Ohio – Fruit flies don’t appear to use their tiny, translucent wings for optimal flight, as one might expect. The speedy appendages seem to be doing double duty, helping the insect sniff out food, mates and other important scents, according to new research from The Ohio State University. A researcher with a background in mechanical engineering and an expert in olfaction – that’s smelling to most of us – collaborated on the study, which appears in the journal Nature Communications. Scientists have long wondered about the balance between an insect’s dual needs for flight and odor-based navigation. Inevitably, the wings disrupt odor plumes and that led many researchers to speculate that nature might not have designed the wings just for flight, but to draw aromas to the scent-detecting antennae as well. Each of the Ohio State researchers was skeptical about this dual-purposes hypothesis for his own reasons. Kai Zhao, the olfaction and bioengineering expert, thought the idea didn’t make a whole lot of sense based on the design of the fruit fly. “People have thought the wings might contribute to scent detection, but the antennae, the bug’s primary scent trackers, are perched atop its head, well in front of the wings,” he said. “Imagine a speedboat skimming across a calm lake; its bow is always hitting the calm water, ahead of the wake and the turbulence generated by the propeller – why wouldn’t the antennae be on the tail, catching all the scents downwind from the wings?” said Zhao, an associate professor of otolaryngology at Ohio State. Study co-author Chengyu Li’s mechanical engineering background led him to figure that the bug’s wings were made for speed and agility and likely nothing more. “I previously worked on projects looking at aerodynamics that could be applied to drones. For researchers doing this kind of work, we all assume that nature is the best designer and that the wing is primarily designed for flight,” said Li, a postdoctoral researcher currently studying the mechanics of nasal airflow. “These tiny insects have limited energy and they must use it well or they’ll die, so the wing has to be very efficient,” he said. The duo satisfied their curiosity with a computer simulation of a fruit fly in flight, encountering a plume of scent. Haibo Dong, an expert in insect aerodynamics at the University of Virginia, also worked on the study. The team, the first to create a simulation such as this, was able to replicate the wing movements of the insect based on previous observations of actual fruit flies by other researchers. “We thought, ‘Why not simulate an odor plume and see what the wing is doing to it?’” Zhao said. What they saw was fascinating. The bug’s wings don’t just flap up and down – there’s a dip forward and up as the wings approach the fruit fly’s head, a motion that appears to “scoop” streams of odor right to the insect’s antennae. “We can see that the insect’s wings could help it detect food, survive, and find mates,” Li said. The bottom section of wing, they saw, seemed to be important for the odor “scoop,” so Zhao and Li wondered if they could alter this structure and find out more about whether it would hinder speedy flight for the fruit fly. On the computer simulation, they removed this part of the wing, which represents about 20 percent of its structure but is responsible for only about 5 percent of its lift, according to their calculations. Then they ran the scent/flight simulations again. The new model didn’t hinder flight. In fact, it improved the efficiency of the already-racing wings of the fruit fly, which usually beat at about 200 hertz, the equivalent of about 12,000 revolutions per minute. But the wing alterations rendered the computer-simulated insect’s wings much less successful at redirecting scents to the antennae. Plumes that were drawn in and up before sailed right past the virtual bug. That led the researchers to speculate that the fruit fly’s wings evolved to support two of its life needs: fast transport and detection of the faint odors in its atmosphere. The research could inform future engineering studies modeled on nature’s fliers, particularly work to refine drones, Zhao said. In fact, there could be applications related to military drones designed to “smell” threats, such as bombs or chemical weapons, he said. The researchers are interested in applying this type of computer simulation to other insects. Bob Jacobs does not work for, consult, own shares in or receive funding from any company or organization that would benefit from this article, and has disclosed no relevant affiliations beyond their academic appointment. Conservationists have designated August 12 as World Elephant Day to raise awareness about conserving these majestic animals. Elephants have many engaging features, from their incredibly dexterous trunks to their memory abilities and complex social lives. But there is much less discussion of their brains, even though it stands to reason that such a large animal has a pretty big brain (about 12 pounds). Indeed, until recently very little was actually known about the elephant brain, in part because obtaining well-preserved tissue suitable for microscopic study is extremely difficult. That door was opened by the pioneering efforts of neurobiologist Paul Manger at the University of the Witwatersrand in South Africa, who obtained permission in 2009 to extract and preserve the brains of three African elephants that were scheduled to be culled as part of a larger population management strategy. We have thus learned more about the elephant brain in the last 10 years than ever before. The research shared here was conducted at Colorado College in 2009-2011 in cooperation with Paul Manger, Columbia University anthropologist Chet Sherwood and neuroscientist Patrick Hof of the Icahn School of Medicine at Mount Sinai. Our goal was to explore the shapes and size of neurons in the elephant cortex. My lab group has long been interested in the morphology, or shape, of neurons in the cerebral cortex of mammals. The cortex constitutes the thin, outer layer of neurons (nerve cells) that cover the two cerebral hemispheres. It is closely associated with higher cognitive functions such as coordinated voluntary movement, integration of sensory information, sociocultural learning and the storing of memories that define an individual. The arrangement and morphology of neurons in the cortex is relatively uniform across mammals – or so we thought after decades of investigations on human and nonhuman primate brains, and the brains of rodents and cats. As we found when we were able to analyze elephant brains, the morphology of elephant cortical neurons is radically different from anything we had ever observed before. The process of exploring neuronal morphology begins with staining brain tissue after it has been fixed (chemically preserved) for a period of time. In our laboratory we use a technique over 125 years old called the Golgi stain, named after Italian biologist and Nobel Laureate Camillo Golgi (1843-1926). This methodology set the foundation of modern neuroscience. For example, Spanish neuroanatomist and Nobel Laureate Santiago Ramon y Cajal (1852-1934) used this technique to provide a road map of what neurons look like and how they are connected with each other. The Golgi stain impregnates only a small percentage of neurons, allowing individual cells to appear relatively isolated with a clear background. This reveals the dendrites, or branches, that constitute the receptive surface area of these neurons. Just as branches on a tree bring in light for photosynthesis, the dendrites of neurons allow the cell to receive and synthesize incoming information from other cells. The greater the complexity of the dendritic systems, the more information a particular neuron can process. Once we stain neurons, we can trace them in three dimensions under the microscope, with the help of a computer and specialized software, revealing the complex geometry of neuronal networks. In this study, we traced 75 elephant neurons. Each tracing took one to five hours, depending on the complexity of the cell. Even after doing this kind of research for years, it remains exciting to look at tissue under the microscope for the first time. Each stain is a walk through a different neural forest. 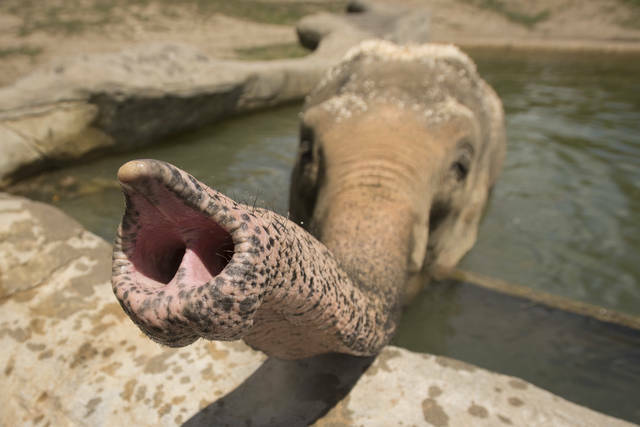 When we examined sections of elephant tissue, it was clear that the basic architecture of the elephant cortex was different from that of any other mammals that have been examined to date – including its closest living relatives, the manatee and the rock hyrax. Here are three major differences that we found between cortical neurons in the elephant and those found in other mammals. First, the dominant cortical neuron in mammals is the pyramidal neuron. These are also prominent in the elephant cortex, but they have a very different structure. Instead of having a singular dendrite that comes off the apex of the cell (known as an apical dendrite), apical dendrites in the elephant typically branch widely as they ascend to the surface of the brain. Instead of a single, long branch like a fir tree, the elephant apical dendrite resembles two human arms reaching upward. Second, the elephant exhibits a much wider variety of cortical neurons than do other species. Some of these, such as the flattened pyramidal neuron, are not found in other mammals. One characteristic of these neurons is that their dendrites extend laterally from the cell body over long distances. In other words, like the apical dendrites of pyramidal cells, these dendrites also extend out like human arms uplifted to the sky. Third, the overall length of pyramidal neuron dendrites in elephants is about the same as in humans. However, they are arranged differently. Human pyramidal neurons tend to have a large number of shorter branches, whereas the elephant has a smaller number of much longer branches. Whereas primate pyramidal neurons seem to be designed for sampling very precise input, the dendritic configuration in elephants suggests that their dendrites sample a very broad array of input from multiple sources. A tuskless matriarch elephant shows kindness toward young orphan elephants trying to find their way in the Kenyan bush. Observations of elephants in their natural habitat by researchers such as Dr. Joyce Poole suggest that elephants are indeed thoughtful, curious and ponderous creatures. Their large brains, with such a diverse collection of interconnected, complex neurons, appear to provide the neural foundation of the elephant’s sophisticated cognitive abilities, including social communication, tool construction and use, creative problem-solving, empathy and self-recognition, including theory of mind. The brains of all species are unique. Indeed, even the brains of individuals within a given species are unique. However, the special morphology of elephant cortical neurons reminds us that there is certainly more than one way to wire an intelligent brain. It takes time to see which finding might be a golden egg. Jeffrey Gardner receives funding from the US Department of Energy. The Senate recently proposed to increase the research budgets of the National Institutes of Health, National Science Foundation and NASA. While this is encouraging to the many scientists whose research is dependent on grants from these agencies, it comes at a time when scientific research is under increased scrutiny. But having no obvious immediate application doesn’t mean something will never be of use. Perhaps the difficultly in justifying basic research is in part a branding problem. The goal of this type of work is to understand the fundamental principles of nature, and it spans the STEM fields (Science, Technology, Engineering and Mathematics). Once these fundamental principles are understood, they can be applied to more translational research that can have direct benefits to patients or consumers. But the benefits of basic research are often not instantly recognizable. Potential long-term payoffs – perhaps ones that haven’t even been imagined yet – won’t help consumers or patients now. There are countless discoveries whose eventual impact would have been very difficult to predict when the research was in its infancy. Honors like the Golden Goose Award, presented every fall since 2012, combat the idea of basic research being “wasteful” or “useless” by underscoring that it’s actually the foundation for further scientific innovation. Given enough time and support, basic research can yield significant real-world benefits that were hard to predict in advance. Here are two examples of scientific curiosity paying substantial dividends decades after the initial discovery. It was very unlikely that scientists were thinking of medical applications when in the 1950s they started studying why some jellyfish glow. Marine biologists discovered that the jellyfish Aequorea victoria was bioluminescent. What was unclear at the time was how this jellyfish produces its light, which is a vibrant green color. Seven years later a group of researchers discovered that the living light from the jellyfish came from a single protein they called aequorin. Strangely, the light from the purified aequorin protein was blue, not green. After another eight years of work they found that a partner protein to aequorin, which they called green fluorescent protein (GFP), produced the vibrant green-colored light seen in the living jellyfish. The question then became how did the two proteins work together to produce this light? It took another 10 years of work to get the answer. A series of papers published in the early 1970s characterized a small molecule called a chromophore that integrated into the GFP protein structure. The structure of GFP was discovered in the early 1990s, which further helped researchers understand how this protein created light in living cells. The impact of GFP has also been recognized with a Nobel Prize in 2008 and an inaugural Golden Goose Award in 2012. A more recent example of how basic research is now driving incredible innovation can be found in the fields of synthetic biology and genome editing, thanks to what actually started out very humbly as the characterization of bacteria. In the late 1980s, researchers found that certain bacteria had short repeated regions in their genome, but they didn’t know their purpose. They called these DNA sequences Clustered Regularly Interspaced Short Palindromic Repeats; you’ve probably heard its acronym nickname CRISPR. Work characterizing and cataloging bacteria that had these short repeated sequences continued for 20 years before researchers discovered proteins associated with the short DNA repeats. They called them CRISPR associated, or Cas, proteins. One major advance happened in 2005 when researchers realized that CRISPR sequences found in bacterial genomes match DNA in phages, viruses that infect bacteria. A few more years later, scientists showed that the CRISPR-Cas system was a type of adaptive immunity that bacteria use to remember phage infection and prevent it from happening again. The Cas protein cuts invading phage’s DNA to stop infection. This discovery was groundbreaking; no one had known something as simple as a single-celled bacterium could have a sophisticated immune system. And then in 2013, researchers realized this type of directed DNA cutting could be used to edit the genomes of other organisms, not just bacteria. The method was quickly adapted for use in yeast, worm, fruit fly, zebrafish, mouse, plant and human cells. Genome editing in this way will have far-reaching implications for everything from food production to stem cell therapies. Thirty years after its discovery, the scope of CRISPR research is truly impressive; a current literature search in PubMed returns over 10,000 peer-reviewed published papers using the search term “CRISPR.” The technologies stemming from CRISPR have not won a Golden Goose Award or Nobel Prize yet, but some speculate it is only a matter of time. Answering fundamental questions – Why do jellyfish glow? Why do bacterial genomes have short repeating DNA sequences? – can lead to innovation and tangible benefits in many aspects of everyday life. And a Golden Goose Award or Nobel Prize is not required to show that a discovery has translational application. An entrepreneurship study published in 2017 highlighted that more than 75 percent of research articles published are eventually referenced in at least one patent disclosure. This study showed a strong link between patent applications, ostensibly a quantitative metric of innovation, and basic research taking place at universities and government laboratories. Real-world impacts stemming from basic research can take decades to unfold. If basic science is not supported and funded in the U.S., other countries will take over the innovation leadership role. Much like the goose that laid golden eggs, time and patience are required to get the most out of basic research.